-ever put in a ton of screws while building a fence or a deck? or hanging drywall or tile backer board? or screwing in door jambs? +this device is specifically for running screws nothing else, so it is fast and effective. The only way to make this task faster is to put a screw feeder on the nose. With this gun and some practice, I can screw down a 3'x5' backboard in well less than 60sec. -noticed your screws are not sunk evenly and some minor adjustment with the drill or a screwdriver is necessary, or you've overdriven the screw and the head is too deep to effectively hold? +wood is an especially inconsistent material. Friction, density, knots etc all mean that the amount of torque necessary to drive the screw home is rarely consistent. With this gun, you are putting in maximum torque until the screw is the right depth, then none b/c the clutch disengages. This gun drops torque really fast at the right depth so its hard to overdrive the screw. Because the torque level is high until the right depth, it powers through hard or "sticky" wood with ease. -had trouble with torque spikes or jerks from a drill while trying to set the screwhead depth accurately? +the motor on this drill is spinning really fast so the torque output is silky smooth. The clutch engages and disengages smoothly. -the gun shape is really comfortable, the trigger is big. It's easy to operate with one hand using your pinky or bottom two fingers on the trigger. -motor is reversible so if you need to pull out a screw, pop off the depth adjuster and go for it. Depth adjuster pops off just by pulling on it. -depth adjuster is precise. One click either way adjusts the depth by ~1/64". It keeps its position despite constant use/abuse. 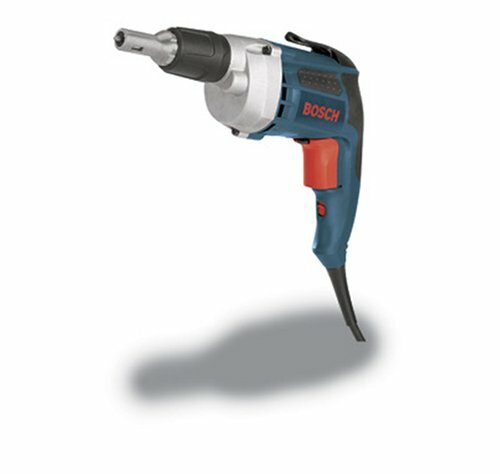 -there's enough torque to easily twist off even hardened screws. This is especially true when driving into "stiff" materials like hardibacker, not a problem for typical wood etc. Here, you have to have more technique and either use lower motor speed or set the depth very carefully. -no need to stop the motor between setting screws, just keep the trigger pulled and allow the clutch to engage and disengage as you drive and then set the screw. 5/ listen or feel for the clutch start to disengage (chatters like a cordless drill clutch) as the screw hits the right depth. Pull the gun off the screw & you're done. So why only 3 stars? After a few uses, the bit holder is not as effective. If you pull the gun off the screw at an angle or before the clutch is fully disengaged, sometimes the bit stays with the screw and not in the gun. I'm not a contractor so this minor productivity loss is not a big deal for me, but would be for others... Maybe the Hilti gun (which has good reviews) would do better at this? Also, the motor @ 2500rpm is noisy. Summary: fast and comfortable gun which excels at setting screws into a huge variety of materials with a minor problem keeping the bit in the gun's chuck/holder: 3stars.